Though gender-based violence occurs in the public domain as well as the private, violence in the home is often overlooked, he says. There are a number of responses available to help curb public violence, including improved policing, hotspot mapping, and mobile and internet technology, but relatively few policy interventions can penetrate the bedroom door. This makes it far more difficult to measure and address. Conventional wisdom also maintains that “the poorer you are the more likely you are to perpetrate gender-based violence,” he says, but this may not always be the case. In Santiago, Chile, Omenya found high rates of gender-based violence across all economic classes – the only distinction was that wealthier households hid it better, motivated in part by their perception of gender-based violence as a lower-class phenomenon. 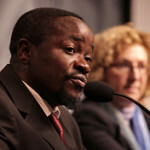 Strategies to reduce gender-based violence tend to look at it in isolation. But new research suggests it may be linked to other forms of violence, like political conflict, and should be viewed in a broader societal context. Policy responses should seek to illuminate and address the full range of gender-based violence – including structural, private, and higher-income – rather than focus only on its most visible manifestations, he says. 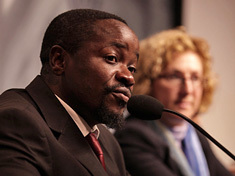 Alfred Omenya spoke at the Wilson Center on February 18.